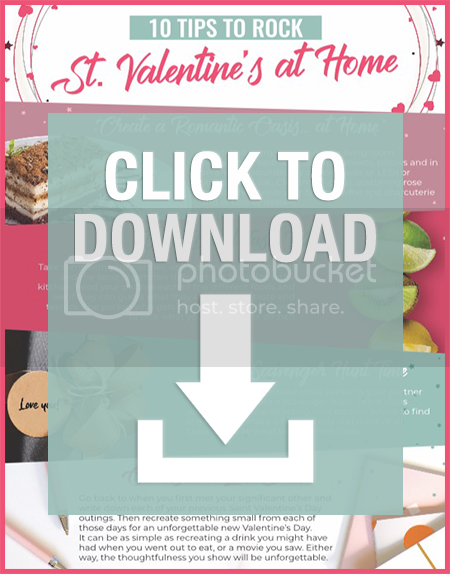 Check out how you can have a romantic Valentines Day at home this year! There’s no need to head to an expensive restaurant for dinner and dancing when you can create the perfect evening at home for you and your loved one. Having a romantic Valentines Day at home isn’t difficult at all. All it requires a little bit of advanced planning and preparation. If you have younger kids, see if you can have a friend or family member take them for the evening. Or, consider celebrating Valentine’s Day while they are at school. Valentines Day ideas don’t have to be expensive or fancy. It really should be all about spending time with the one you love, not about how much you spend. Here are a few simple but fun ways to celebrate Valentines Day. What can I do for my wife on Valentines Day? Skip the crowds and the expense and enjoy a romantic dinner at home. You can go all out and make something expensive if you like. Or, opt for something frugal like spaghetti and garlic bread with a garden salad. Make sure you offer to do the dishes too! What to do on Valentine’s Day with your girlfriend? Take the day off work and spend it creating a special day together. If the weather is nice, you can go for a picnic or take a walk through the park. If it’s colder where you live, bundle up and take a moonlight walk in the snow to admire the stars. Stop by whatever local attractions you have in your area. Visit a museum or an art gallery. Plan a staycation at home with movies and popcorn. Go ice skating on a frozen pond. Or slide down the biggest hill you can find on a sled. Valentine’s Day is really all about spending time together. While having a nice dinner and taking a romantic walk under the stars is nice, there are a lot of ways to enjoy the day. Create a special oasis for Valentine’s Day by adding throw pillows, scented rose petals, and twinkling fairy lights. Make or purchase small presents your partner will love and create a scavenger hunt. Leave clues around the house directing your partner where to find the next gift. Make it fun and silly and most of all tailor-made to what your partner loves. You don’t need to go crazy with spending on Valentine’s Day. A small bouquet of flowers, a few nice chocolates, a bracelet or small bottle of perfume are all ideas that should not cost a lot of money. This Saint Valentine’s Day tell your partner you love them by giving gifts that satisfy the senses. Spray a little perfume on your Saint Valentine’s Day card, put your present in a fun box with a big bow, get your significant other a favorite food or dance to a romantic song. The more creative you are, the more people appreciate the thought and effort you put into making them feel special! The Roman Catholic Church still recognizes Valentine as a saint, listing him in the February 14 spot of Roman Martyrology. Saint Valentine is the Patron Saint of affianced couples, engaged couples, happy marriages, love, lovers, and plague. He is represented in pictures with birds and roses and his feast day is celebrated on February 14. You have questions about the Catholic faith and what it means to be Catholic. We have answers. Using a team of witty writers, appealing hosts, and even some learned theologians, we’ve created shareable, snackable videos that teach the timeless truths and deep history of the Church with humor and heart. Produced in the Family Theater Productions studios on Sunset Boulevard in Hollywood, CATHOLIC CENTRAL entertains, enlightens and inspires. Learn more about Catholic Central. If you want more romantic Valentines Day ideas, check out the PDF. Want more Valentine’s Day fun? Why not try a double sweater? I am not responsible for prizes that do not arrive. US only.